Green is one of those inbetween kind of colours existing at neither end of the spectrum. It might not always delight the eye in an obvious way like those cheekily vivacious reds and blues. But it quietly does its job giving us things like grass, all the food our parents told us was healthy, and leprechauns. All the important stuff really we can’t do without. This green oilcloth range takes this unassuming but yet vital colour and shows what interesting effects can be achieved with it. From our lovely lime green tablecloth, super stylish sage green and to the darker forest variety we offer everything. With this floral design wrapped In ovals, you'll be sure to create a sense of nostalgia in any room. Perfect design for any home this Red and green Bird Trail will liven up even the dullest room. Treat yourself to this incredibly stylish Duck Egg Zig Zags Chevrons Oilcloth. 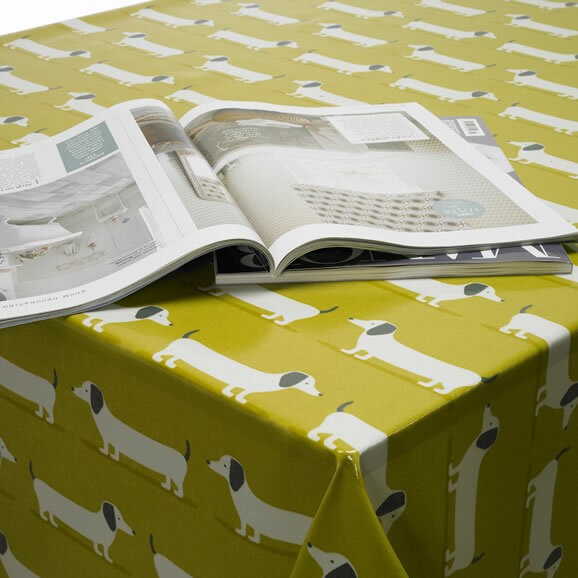 In olive with a black stem, this iconic Orla Kiely Multi-Stem Oilcloth Tablecloth is a must for the fashion conscious.